If you’re looking for the most fuel-efficient car in the category, that would be its sibling, the Toyota Prius C—at a price that starts just under $20,000. The 2015 Toyota Yaris gets an eye-catching new face, spruced-up interior trims, and a somewhat quieter interior, but it lags behind the current crop of U.S.-market subcompacts in many ways. The 2015 Toyota Yaris isn't the company's smallest model, but it is Toyota's lowest-priced car. The Yaris slots below the best-selling Corolla and Camry sedans. 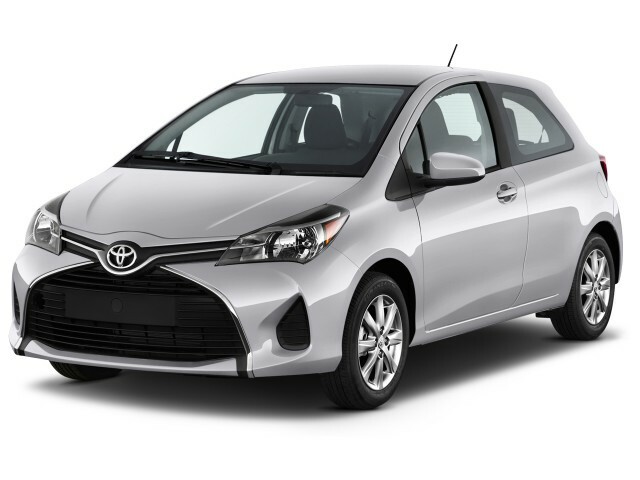 With some overlap with the same-sized Scion xD and Toyota Prius C hybrid the Yaris takes a more traditional tack on what a small car should be. Overall, though, the 2015 Toyota Yaris ends up feeling a little lost in the 1990s, when a small economical engine, a low sticker price, and great maneuverability were together enough to appease budget-strapped commuters. The Yaris remains a competent subcompact hatchback, yet one with very little that causes it to stand out above other subcompacts in this increasingly competitive market segment. Thanks to some design work originating in France, where the Yaris is built for the U.S., this model is more visually appealing, and it gets even more suave, sharp, and Euro-influenced for 2015. 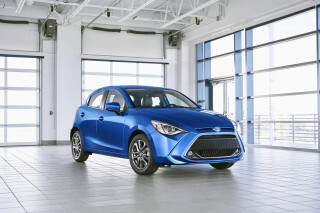 The overarching design has been preserved—tall yet nicely proportioned from the side, in either three- or five-door versions—the Yaris gets new detailing, with new hood sculpting, a swooping line of brightwork around a large Toyota emblem, and a larger trapezoidal grille with new black ‘mesh’ design texturing—results in a visual sum that isn’t just bolder, as Toyota likes to point out, but more flamboyant and original, as we see it. Inside, the cabin remains far more stylish and practical than previous Yaris generations (yes, we've *almost* forgotten about the center-mounted gauge cluster of its predecessor). The 2015 revamp also brings soft-touch materials to the instrument panel, a new sport gauge cluster for the SE, and new metallic and chrome accent trim throughout. Overall, the interior impresses as refreshingly straightforward and intuitive next to the gimmicky interior layouts of some other models in this class. The dash has horizontal, shelf-like lines and the controls are simple, cheerful, and easy to understand. There’s also a large cohort of built-in storage spaces, in the form of trays, cupholders, bins, and the like—including a long tray at the bottom of the dash for the passenger. As impressive as the styling is in reaching out of the comfort zone of Camry and Corolla, it's what's under the hood that lets down the whole package. The only engine offered in the 2015 Toyota Yaris is a 106-horsepower 1.5-liter four-cylinder. Even compared to much of what's now offered in this class, it's remarkably low-tech—no direct-injection or turbocharging here—and trying to access its power zone will feel a lot like you're behind the wheel of a 1990s econocar again. Performance is relatively tepid, and that's if you shift your own gears with the standard five-speed manual gearbox. The four-speed automatic that most will pick is one of the only ones left on the market, with a painfully wide gap between third and fourth gear as it seems, while competitors from Chevrolet, Ford, Honda, and Nissan have five- or six-speed automatics or continuously-variable transmissions (CVTs)—with better fuel-efficiency ratings reflecting the newer technology. Once you're underway and in the right gear, the 2015 Yaris feels light; and at around 2,300 pounds (it's about 20 pounds lighter yet this year), it's one of the lighter subcompacts on the market. This year also brings suspension improvements that include softer springs, a stiffer torsion beam in back, and stiffer shocks altogether, plus some other engineering improvements. The Yaris has better electric power steering than many other Toyotas, while the Yaris SE in particular has a stiffer suspension and thicker anti-sway bars, which deliver flatter handling without much impact on ride comfort, which is good. Brakes on all models work well, and the pedal is firmer and less mushy than in some competitors. If you want rear disc brakes, they're the exclusive domain of the Yaris SE. The interior is best described as straightforward but unremarkable. Storage space inside is good, and the front seats are comfortable and supportive, with plenty of room. Rear seats are a different story; they're smaller than those in many competitors, particularly the Nissan Versa Note, and the Yaris is more usable for two adults than for four. 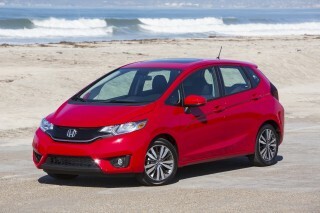 Neither cargo space nor flexibility are as good as the perennial class leader, the Honda Fit. Ride quality is even better than it was, though, and with more sound insulation for 2015, the Yaris is now a relatively quiet cruiser—if you're not pushing the engine. Toyota has bolstered the Yaris structure somewhat for 2015, although it doesn't qualify as anything completely new, so we're not sure if it will be retested by either of the U.S. safety agencies. IIHS and federal crash-test results have been a mixed bag. There are essentially just three factory builds of the 2015 Toyota Yaris: the base L, the mid-level LE, and the sporty SE. But the bright side is that there really isn’t much to bump the sticker price all that higher. Top SE models are the ones that really stand out; they add 16-inch machined-finish alloy wheels, rear disc brakes, projector-beam headlights, LED daytime running lamps, a black front grille, a rear spoiler, upgraded seats with sport fabric, a sport instrument cluster, and leather trim for the steering wheel and shift lever. For 2015, even base L versions of the Yaris include a split-folding rear seat and height-adjustable driver's seat—both items that were only in the upper trims last year—and all 2015 Yaris models gain an Entune Audio system that has a 6.1-inch touch screen, HD Radio, a USB port, an auxiliary input, voice recognition, and Bluetooth audio streaming—complementing Bluetooth hands-free calling. At every trim level you get six speakers; you can now add navigation as a dealer- or port-installed option, although it's worth noting that Yaris models don't get the Entune App Suite connectivity now offered on most other Toyota models. The 2015 Toyota Yaris gets saved from anonymity by a new, more overtly Euro-influenced front end; and its interior is charmingly straightforward. The Yaris already verged away from U.S. small-car convention in going hatchback-only—and it seems to further its distinction as a suave, sharp, Euro-influenced hatch for 2015. Unlike the Honda Fit, with its utilitarianism showing through with exterior cues that still fully size up to Honda's larger vehicles, the Yaris takes a design direction that doesn't necessarily look conceived by the same teams that drew the current Corolla, or the new 2015 Camry. And with most of the design actually done in France, where it's assembled, it's a foreign entity through and through. While the overarching design has been preserved—tall yet nicely proportioned from the side, in either three- or five-door versions—the Yaris gets new detailing for 2015, passed directly from the refreshed Toyota Aygo first shown at the 2014 Geneva Motor Show. Indeed, the curvaceous look of the new front-end styling—with new hood sculpting, a swooping line of brightwork around a large Toyota emblem, and a larger trapezoidal grille with new black ‘mesh’ design texturing—results in a visual sum that isn’t just bolder, as Toyota likes to point out, but more flamboyant and original, as we see it. 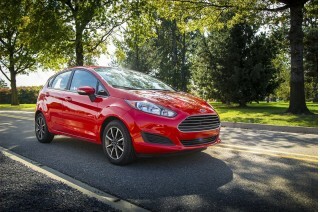 New headlight units incorporate some attractive detailing and on SE models include a new fog lamp design. Those SE models continue to get a more aggressive look, from wheels to bumpers, that gives them a flavor that looks a bit rally-racer influenced; and sown below, under the rear bumper, we even see hints of Scion FR-S in the Yaris SE's new diffuser panel. Inside, the cabin remains far more stylish and practical than previous Yaris generations (yes, we've *almost* forgotten about the center-mounted gauge cluster of its predecessor). The 2015 revamp brings soft-touch materials to the instrument panel, a new sport gauge cluster for the SE, and new metallic and chrome accent trim throughout. The 2015 Toyota Yaris delivers up a 1990s flavor of small car that's novel, but disappointing compared to nearly every other vehicle in this class. The sportier, even more Euro-suave hot-hatch look of the refreshed 2015 Toyota Yaris definitely hints at more excitement; but under the hood and from the driver's seat this is a small car that fails to deliver much excitement at all—unless you get the SE with the manual transmission, find your kicks under 30 mph, and are willing to look past some sore points. The only engine offered in the Yaris is a 106-horsepower 1.5-liter four-cylinder. Even compared to much of what's now offered in this class, it's remarkably low-tech—no direct-injection or turbocharging here—and trying to access its power zone will feel a lot like you're behind the wheel of a 1990s econocar again. Its peak torque of 103 pound-feet arrives at 4,200 rpm, and it needs to be revved well past 3,500 rpm—where there's a lot of boom and engine noise—to access what feels like the bulk of it. Peak horsepower doesn’t arrive until a screaming 6,000 rpm. Performance is relatively tepid, and that's if you shift your own gears with the standard five-speed manual gearbox. You'll have to keep the revs up, but the car will move smartly around town, though it starts to run out of breath at highway speeds. Given the light weight, though, the Yaris isn't particularly fast--and it can feel distinctly underpowered when maximum acceleration is required. That manual has one more ratio than the optional and aging four-speed automatic transmission (it's one of just a few left on the market), which is an especially incompatible companion to the peaky engine, delivering dramatic downshifts to widely spaced gears when asked for more power. Competitors from Chevrolet, Ford, Honda, and Nissan have five- or six-speed automatics or continuously-variable transmissions (CVTs) and their better fuel-efficiency ratings reflect the newer technology. The automatic also seems to deliver more engine noise, somehow, even when driving at a more leisurely pace. Once you're underway and in the right gear, the 2015 Yaris feels light; and at around 2,300 pounds (it's about 20 pounds lighter yet this year), it's one of the lighter subcompacts on the market. This year also brings suspension improvements that include softer springs, a stiffer torsion beam in back, and stiffer shocks altogether. The steering rack ratio is also a bit shorter, and this year's chassis improvements include better body rigidity through a new body brace, stronger windshield adhesive, more spot welding, and new seat base structure. The Yaris retains its suspension layout, with MacPherson front struts and a torsion-beam rear setup. We still really like the feel of the electric power steering at low speeds, where it seems to load up rather nicely from center, and it tracks well; the somewhat softer spring rates for this year also seem to have the net effect of reducing the amount that this model is thrown off-course by bumps and rippled roads. Suspension tuning is good, and the Yaris handles better than you might expect—though it's still no German hot hatch. The Yaris has better electric power steering than many other Toyotas, which have historically been vague and numb. The steering in the Yaris stays on center at higher speeds but progressively increases the effort at lower speeds--making it fun in the city and confident on the highway. The SE model has a stiffer suspension and thicker anti-sway bars, which deliver flatter handling without much impact on ride comfort, which is good. Brakes on all models work well, and the pedal is firmer and less mushy than in some competitors. If you want rear disc brakes, they're the exclusive domain of the Yaris SE. Provided the limited adjustability in the 2015 Toyota Yaris does you good as a driver, there’s good passenger space—and this year’s changes bring its cabin noise (although still not its engine noise) up to par. Whether you get the three-door or the five-door hatchback, the 2015 Yaris is far from the largest car in the segment. 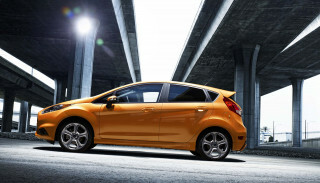 Its size makes it maneuverable and easy to park in tight city streets, but rear-seat space suffers as a result. It's also not particularly space-efficient. But with a retune of the suspension and some additional noise insulation for 2015, it rides better and more quietly. The front seats are a great starting point for getting acquainted with the Yaris. They have plenty of room, and we think they feel more comfortable than those of the Nissan Versa. They're wide enough and have long enough lower cushions that feel like they're from a car a size larger; we're especially fond of the slightly better contouring and side support that SE models get in their upgraded seats. Despite as much as we like the seats, it's rather tough to get into an ideal driving position unless you're maybe average height or shorter, with short arms. This isn't a car for the tall and lanky, as the lower seat cushion doesn't tilt back or down much and the steering column doesn't telescope at all (it only tilts to a limited range). New fabrics throughout the line no longer make this interior feel like one big lint brush—the upholstery is actually quite nice in the SE, although you won't find leather here. Back-seat space in the Yaris is about what you'd expect from the outside, if not a bit better. It's cramped for adults, unless you're willing to do a lot of horse-trading with the front-seat occupants, and then you'll find you can get just enough knee room. Head room is definitely the bright spot, as there was enough of it for those well above six feet tall. Access to the rear seats is far harder in the three-door model than the five-door, one reason that three-door body styles are a relative rarity in this category. The rear seatbacks fold forward and are split in all models, but the resulting cargo floor isn't completely flat--and it's higher than in some competitors, including the supremely flexible Honda Fit. Still, 15.3 cubic feet of cargo volume is respectable, and there's plenty of space for groceries and the like without folding down the seat. The instrument panel is straightforward and, unlike previous Yaris generations, puts the gauges in front of the driver rather than in the center of the dashboard. Storage is good, with several well-placed bins, including one ahead and to the left of the driver that neatly holds a wallet or smartphone. And with the 2015 Yaris, Toyota has answered a complaint in the outgoing model by adding a divider to the shallow shelf that's in front of the driver that should help keep small items from sliding around. Toyota also has added a few further measures beyond just trims and surfaces; there’s also a new glovebox damper to let the compartment door open in a smooth manner; and dual extendable sun visorswith vanity mirrors come with all models. The Yaris has significantly more noise insulation for 2015, Toyota claims—including a new acoustic windshield plus foam insulation in hollow structural spaces—and while we think it now makes the Yaris remarkably isolated from road and wind noise, there can still be too much engine noise for some tastes. This year's refinement improvements help quell a lot of the road and wind noise at speed, based on early impressions—although the roads in our first-drive test loop were extremely smoothly surfaced, for the most part. The Yaris has relatively good ride quality for its class, and Toyota's engineers have mostly eliminated the bobbing motions suffered in some small cars with short wheelbases. The engine is coarse and harsh when revved above about 3,000 rpm, and the archaic four-speed automatic transmission doesn't have enough ratios to keep it quiet at speeds of 70 mph or more. The sum message here is that the Yaris can be taken at face value for versatility and interior space. 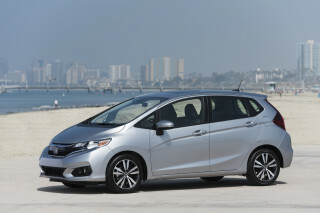 It doesn’t do wondrous things with the space available, like the Honda Fit (or even the Nissan Versa Note hatchback, for that matter), but if commuting is the main priority, they should be no disappointment in comfort versus the subcompact norm. The 2015 Toyota Yaris lacks a strong reputation for occupant protection, although most of its safety ratings are respectable. The 2015 Toyota Yaris is essentially the continuation of a model that's already been around for three model years. While the structural improvements are relatively minor, we're eager to see whether they improve the occupant-safety performance of the Yaris. But based on the crash-test ratings available at this point, we might suggest that if safety if your top priority in a small car, there are better picks. The Yaris five-door hatchback gets decent but not stellar safety ratings from the National Highway Traffic Safety Administration (NHTSA), which gave it a four-star Overall rating. The Insurance Institute for Highway Safety (IIHS) gave the five-door hatchback as Good (its highest rating) on its moderate-overlap front crash, side crash, roof crush, and head-restraint/seats tests. And it's not a good performer in the relatively new small-overlap frontal impact test at all; it achieved only a 'Marginal' rating there. Safety equipment is quite good, with electronic stability control, anti-lock brakes, electronic brake-force distribution and Brake Assist included in all models. There are nine airbags, including a driver knee bag, and LE and SE models include an engine immobilizer. There still aren’t a lot of choices, but with a new infotainment system and available navigation, more of the fundamentals are covered in the refreshed 2015 Yaris. Forget about all the options, packages, and choices. There are essentially just three factory builds of the 2015 Toyota Yaris: the base L, the mid-level LE, and the sporty SE. But the bright side is that there really isn’t much to bump the sticker price all that higher. Yaris L models include air conditioning; power windows, locks, and mirrors; a rear wiper and defogger; and steel wheels with hubcaps. 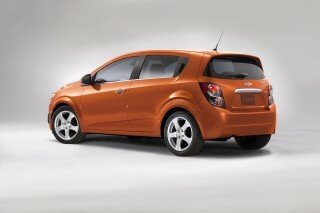 LE models add cruise control, steering-wheel audio controls, keyless entry, added trim, and 15-inch alloy wheels. And SE models add 16-inch machined-finish alloy wheels, rear disc brakes, projector-beam headlights, LED daytime running lamps, a black front grille, a rear spoiler, upgraded seats with sport fabric, a sport instrument cluster, and leather trim for the steering wheel and shift lever. For 2015, even base L versions of the Yaris include a split-folding rear seat and height-adjustable driver's seat—both items that were only in the upper trims last year. One unusual feature is its single-wiper system, using just one large articulated arm rather than the pair found on most other vehicles. It worked very well. There’s one exception. The Yaris has been a step behind in connectivity and technology features, but with its update this year it gains several new items that might be make-or-break features to some shoppers. 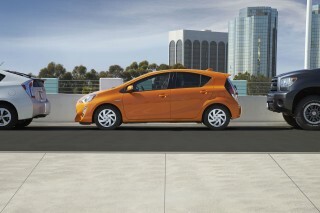 For the first time a navigation system is optional on the Yaris—all trims, as either a port- or dealer-installed add-on. And all 2015 Yaris models gain an Entune Audio system that has a 6.1-inch touch screen, HD Radio, a USB port, an auxiliary input, voice recognition, and Bluetooth audio streaming—complementing Bluetooth hands-free calling. At every trim level you get six speakers; although it's worth noting that Yaris models don't get the Entune App Suite connectivity now offered on most other Toyota models. In an early drive, none of the vehicles we sampled had the available navigation system installed (interestingly, you do get the ‘nav’ button either way), so we can’t yet comment on how well it works. The Yaris doesn’t offer some features, however, in any model. Those include a navigation system, leather upholstery, or heated seats. You'll find no active-safety features or parking aids here either. The 2015 Toyota Yaris lacks fuel economy figures that will wow, although its real-world efficiency is possibly better than those numbers suggest. While Toyota's hybrid models are fuel-efficiency leaders, the 2015 Toyota Yaris is barely par. It gets adequate, but far from stellar, fuel economy. Our test Yaris SE with the four-speed automatic, driven rather aggressively over a 45-mile route on two-lane rural roads—including some full-throttle passing and climbing up near 4,000 feet elevation and back down—returned about 32 mpg, according to the trip computer (matching the EPA Combined number), while a manual-transmission model taken on a somewhat shorter and more level route, returned just over 34 mpg (beating EPA Combined by 1 mpg). The Yaris is rated at 30 mpg city, 37 mpg highway with the five-speed manual gearbox, and 30 mpg city, 36 mpg highway with its outmoded four-speed automatic transmission. It’s one of very few cars left on the market without a five- or six-speed automatic, and that’s likely one of the factors that prevent it from getting anywhere near the vaunted 40-mpg mark on highway fuel economy. Our Yaris is an excellent commuter car that is completely reliable and economic. Looking for a different year of the Toyota Yaris?